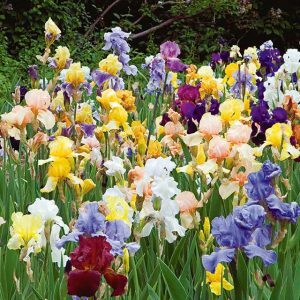 Tall Bearded Irises invigorate summer gardens with their rainbow of colors. You’ll find nearly every shade or color combination in this beloved group of June-Blooming plants named for Iris, the Greek goddess of the rainbow. The sculptural qualities of their elegant blossoms and sword-like foliage are important design elements in perennial borders. Fragrance is often an overlooked quality, yet their perfumes are sweet and pervasive. Flowers appear sequentially on buds spaced along the stems, which should be cut down to the base after blooming is finished. Reblooming Iris will send up new fans that develop flower spikes as they mature later in the season, giving you a second display of showy flowers after many other perennials have passed their prime. Give them a light dose of fertilizer after the first bloom and regular watering when the things get hot. 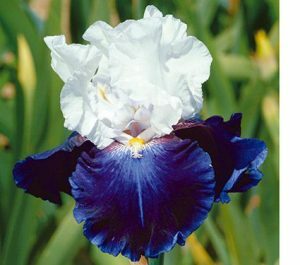 Tall Bearded Iris Captain’s Choice boasts seaworthy shades of deep nautical blue and crisp white that combine in a commanding salute to spring. Bearded Irises are generally easy to grow. Provide full sun to very light shade and well-drained soil. Add sand if your soil is heavy and plant so that the top of the rhizome is above the soil line. Few pests bother them, except for the Iris borer. Ward off that problem by keeping the soil around plants free of weeds and, in fall, do a thorough cleanup around plants because the borer eggs overwinter in plant debris.